Heat the butter in a non-stick frying pan and fry the veal cutlets until they are golden brown on both sides, yet still slightly pink on the inside. Remove the veal cutlets from the pan and sprinkle them with salt and freshly ground pepper. 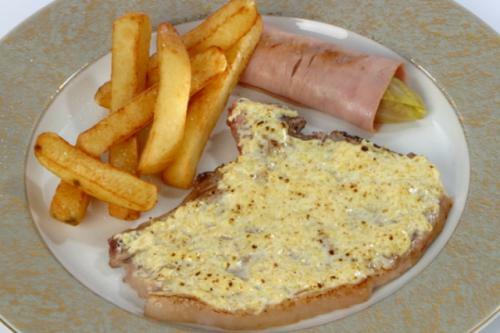 Cover the cutlets with mustard, Gruyère cheese and crème fraîche and finish them off in the oven or under the grill. Pour the calvados and cream into the butter left in the frying pan, reduce it by 2/3, pass it through a fine sieve and then pour it over the cutlets. Serve with thick-cut fries and steamed chicory wrapped in ham.